A fresh complaint has been filed against Kanhaiya Kumar by Bharathiya Janatha Yuva Morcha(BJYM), the youth wing of BJP for his alleged remarks on Indian Army at a student gathering at JNU for an event marking the International Women’s Day. The complaint alleged that Kanhaiya’s remarks were ‘anti-national’ and also he violated the conditions of his bail. It is reported that, Kanhaiya in his speech at the gathering on Tuesday night has said "No matter how much you try to stop us, we will speak up against human rights violations. We will raise our voice against AFSPA. While we have a lot of respect for our soldiers, we will still talk about the fact that in Kashmir women are raped by security personnel." Adding to this, the student leader also allegedly said that “During war in Rwanda 1000 women were raped. In Africa during the ethnic conflict, when military attacks other group firstly their women were raped. You take example of Gujarat; women were not just killed but were raped first,"
The BJYM statement said that “despite the submission of an undertaking before court, Kanhaiya has yet again addressed a gathering of students and uttered poisonous words against the Indian Army, labeling them as rapists of Kashmiri Women"
The BJYM has filed the case at Vasant Vihar Police Station against Kanhaiya Kumar , and also Professor Niveditha Menon for their alleged ‘anti-national’ statements . Ms Menon currently teaches at the Centre for Comparative Politics and Political theory at the School of International Studies. The complaint said that Ms Menon “has been spewing hatred against the Indian Armed Forces in public meetings as well. She made statements like it is recognized worldwide that India is illegally occupying Kashmir”. The police official has said that they have received the complaint and is enquiring about the same, but no FIR has been registered. 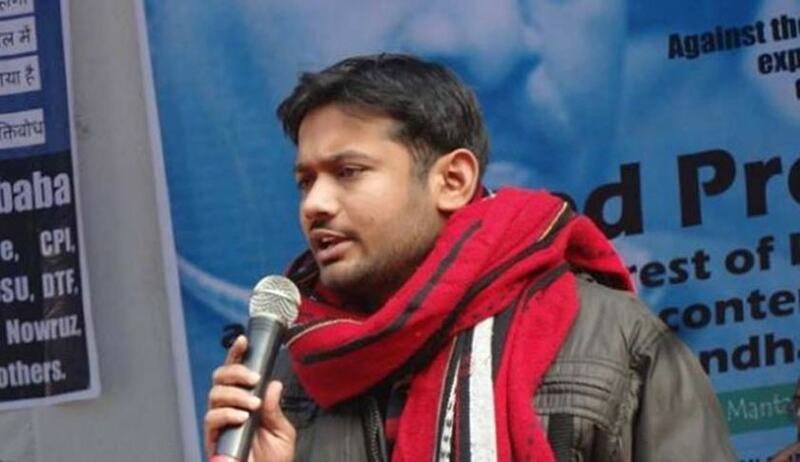 The AISF, the student organization to which Kanhaiya Kumar belongs to, stated that “He made the remarks in context of atrocities on women worldwide and not just in Kashmir. He in no way meant to demean Army or any other force and he clarified that in his speech too". Kanhaiya Kumar was arrested for sedition charges on 12th of February over an event in the JNU campus against the judicial hanging of Afzal Guru, the Parliament attack convict during which anti-national slogans were allegedly raised became a topic of national and international discussions and debates on nationalism and sedition laws. He was granted an interim bail for six months by Delhi High Court last week.